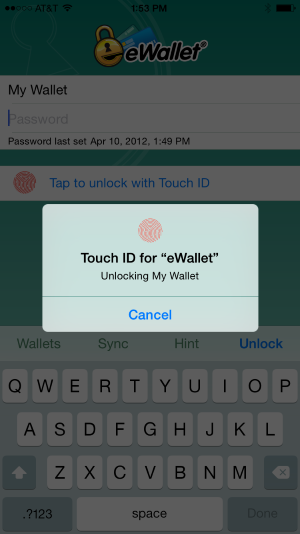 Does eWallet for iOS support Apple's Touch ID? You’re all set, you can now use Touch ID to unlock your wallet. Please see the notes below for important information on using Touch ID will eWallet. If you don’t see the Touch ID panel when you start eWallet, then simply press the “Tap to unlock with Touch ID” button right below the password prompt. When you see the Touch ID panel, you can unlock your wallet using a finger in the same way that you unlock your device. Touch ID is a convenience but is not a permanent substitute for knowing your wallet password. There are several ways that Touch ID can be turned off, so it's really important that you remember the password to your wallet.